A new print journal featuring local poets and their work is targeted for publication in May, 2019. The Shrub-Steppe Poetry Journal is now accepting submissions. Send 1-3 original, previously unpublished poems (one poem per page, five pages max) to Shrub-Steppe Poetry Journal ATTN: Susan Sampson, P.O. Box 238, Malaga, WA 98828. Include a cover letter with your name, mailing address, phone number, email address, poem title(s) and brief bio. “We are asking for a $10 donation per entry to help defray costs,” says Susan. “Contributors will receive a copy of the journal as payment.” Checks should be made out to Shrub-Steppe Poetry. Deadline: March 15, 2019. 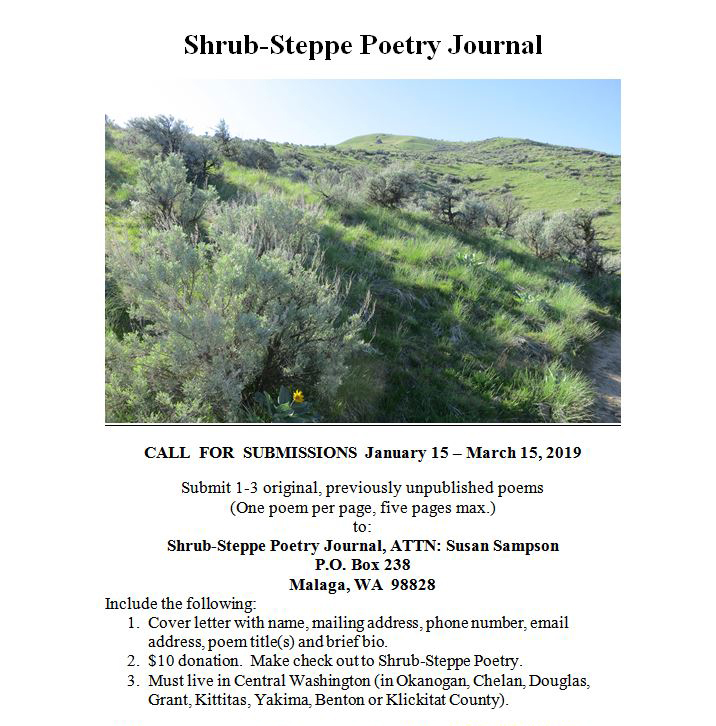 Electronic submissions may be sent to Susan Blair, Editor at sfblair61@gmail.com, with “Shrub-Steppe Poetry Journal” in the subject line and poems in .doc format attachment. Please send donation to above post office box. More info: sfblair61@gmail.com.